Background: Diabetes mellitus, for a long time, has been treated with plant derived medicines in Sri Lanka. Aim: The aim of this study is to determine the efficacy and dose response of oral antihyperglycaemic activity of eight Sri Lankan medicinal plant extracts, which are used to treat diabetes in traditional medicine in diabetic rats. Materials and Methods: Medicinal plants selected for the study on the basis of documented effectiveness and wide use among traditional Ayurveda physicians in the Southern region of Sri Lanka for the treatment of diabetes mellitus. The effect of different doses of aqueous stem bark extracts of Spondias pinnata (Anacardiaceae), Kokoona zeylanica (Celastraceae), Syzygium caryophyllatum (Myrtaceae), Gmelina arborea (Verbenaceae), aerial part extracts of Scoparia dulcis (Scrophulariaceae), Sida alnifolia (Malvaceae), leaf extract of Coccinia grandis (Cucurbitaceae) and root extract of Languas galanga (Zingiberaceae) on oral glucose tolerance test was evaluated. A single dose of 0.25, 0.50, 0.75, 1.00, 1.25, 2.00 g/kg of plant extract was administered orally to alloxan induced (150 mg/kg, ip) diabetic Wistar rats (n = 6). Glibenclamide (0.50 mg/kg) was used as the standard drug. The acute effect was evaluated over a 4 h period using area under the oral glucose tolerance curve. Statistical Analysis: The results were evaluated by analysis of variance followed by Dunnett's test. Results: The eight plant extracts showed statistically significant dose dependent improvement on glucose tolerance (P < 0.05). The optimum effective dose on glucose tolerance for six extracts was found to be 1.00 g/kg in diabetic rats with the exception of C. grandis: 0.75 g/kg and L. galanga: 1.25 g/kg. C onclusion: The aqueous extract of G. arborea, S. pinnata, K. zeylanica, S. caryophyllatum, S. dulcis, S. alnifolia, L. galanga and C. grandis possess potent acute antihyperglycaemic activity in alloxan induced diabetic rats. Herbal medicine is part of the Sri Lankan culture as in many developing countries of the world. The rich Sri Lankan flora of medicinal plants contributes to this practice. About 126 plants belonging to 51 families are used to treat diabetic patients in Sri Lanka and more than 600 species are documented currently as antihyperglycaemic in traditional medicine. However, only a small fraction of the antidiabetic plants used in Sri Lankan traditional medicine are pharmacologically evaluated for their in vivo efficacy. In the present study, we selected eight medicinal plant extracts, which are widely used to treat diabetes mellitus in traditional medicine. There is no scientific data available on the complete range of dose response of selected plant extracts including the therapeutic dose of each extract on glucose tolerance in diabetic rats. Medicinal plants/parts selected are listed in [Table 1]. Therefore, the present study aims towards the comparative screening of eight Sri Lankan medicinal plant extracts for efficacy and dose response on glucose tolerance in alloxan induced diabetic rats. Alloxan monohydrate, D-glucose and glibenclamide were purchased from Sigma-Aldrich Company (St. Louis, MO, USA). Chemicals were of analytical grade and used without any purification. A Sanyo Gallenkamp (model SP65) spectrophotometer was used for spectrophotometric measurements. Stem bark of Gmelina arborea, Spondias pinnata, Kokoona zeylanica, Syzygium caryophyllatum, arial parts of Scoparia dulcis, Sida alnifolia, and root of Languas galanga and leaf of Coccinia grandis were collected during May-June 2011 from the southern region of Sri Lanka. The identity of plants was identified by comparing authentic samples at the National Herbarium, Royal Botanical Gardens, Peradeniya, Sri Lanka. A voucher specimen has been deposited at the Department of Biochemistry, Faculty of Medicine, University of Ruhuna, Sri Lanka (FM/Attanayake/2011/1-8). Selected plant parts were cut into small pieces, dried at 40°C until a constant weight was reached and coarsely ground. Powdered plant material (50.00 g) was dissolved in 400.0 mL of distilled water and refluxed for 4 h. The mixture was strained through cheese-cloth and the final volume was adjusted to 50.0 mL. A single dose of 0.25, 0.50, 0.75, 1.00, 1.25, 2.00 g/kg was administered orally to diabetic test rats. Healthy Wistar albino rats with 220 ± 25 g body weights were used to carry out experiments. They were housed in standard environmental conditions at the animal house of Faculty of Medicine, University of Ruhuna, Sri Lanka (temperature 25°C ± 2°C and relative humidity: 55-65% and 12 h light/dark cycle). Rats were fed with standard diet with free access to water before and during the experiment. The rats were randomized into various groups and allowed to acclimatize for a period of 7 days under standard environmental conditions before the commencement of the experiment. The animals described as fasting were deprived of food and water for 16 h ad libitum. All protocols used in this study were approved by the Ethics Committee of Faculty of Medicine; University of Ruhuna, Sri Lanka guided by the Council for International Organizations of Medical Sciences international guiding principles of biomedical research involving animals. Diabetes was induced in 16 h fasted rats by intraperitoneal administration of alloxan monohydrate dissolved in sterile saline at a dose of 150 mg/kg. The rats were maintained on 5% D-glucose solution for the next 24 h. Rats were allowed to stabilize for 3 days and blood samples were drawn from the tail vein on the 3 rd day to determine the blood glucose concentrations to confirm the development of diabetes mellitus. Rats with fasting blood glucose value of 9.70 mmol/L (equal to fasting serum glucose concentration of 11.0 mmol/L) or above were considered as hyperglycaemic and used for the experiments. Rats were randomly divided into 11 groups containing six animals in each group. Each group (III-X) consisted of diabetic rats with six subgroups (a-f) receiving an oral single dose of 0.25, 0.50, 0.75, 1.00, 1.25, 2.00 g/kg of relevant plant extract through a stomach tube. All animals were fasted before the treatment. Group I: Untreated healthy rats; received distilled water. Group II: Untreated diabetic rats; received distilled water. Group III (a-f): Diabetic rats; received the bark extract of G. arborea. Group IV (a-f): Diabetic rats; received the bark extract of S. pinnata. Group V (a-f): Diabetic rats; received the bark extract of K. zeylanica. Group VI (a-f): Diabetic rats; received the bark extract of S. caryophyllatum. Group VII (a-f): Diabetic rats; received aerial plant extract of S. dulcis. Group VIII (a-f): Diabetic rats; received the aerial plant extract of S. alnifolia. Group IX (a-f): Diabetic rats; received the root extract of L. galanga. Group X (a-f): Diabetic rats; received the leaf extract of C. grandis. Group XI: Diabetic rats; received the standard drug glibenclamide (0.50 mg/kg). Acute toxicity testing was performed for plant extracts following the Organization for Economic Cooperation and Development guideline 423, fixed dose procedure. The healthy rats were observed after administration of a single oral dose of 0.25, 0.50, 0.75, 1.00, 1.25, 2.00 g/kg extract for any adverse signs and symptoms at hourly intervals for the next 24 h and thereafter for 2 days. All results were expressed as mean ± standard error of mean. The data were analysed using analysis of variance and the mean values for each group were compared by Dunnett's multiple comparison test. Acute toxicity studies revealed that the administration of stem bark extract of G. arborea, S. pinnata, K. zeylanica, S. caryophyllatum, aerial part extract of S. dulcis, S. alnifolia, root extract of L. galanga and leaf extract of C. grandis did not produce significant changes in the behaviour of animals. All the animals were physically active and no death was observed up to the dose of 2.00 g/kg which may be considered as a therapeutic advantage. The improvement on glucose tolerance with plant extracts was dose dependent. The mean total area under the curve values of untreated healthy, untreated diabetic and diabetic test rats for the range of doses 0.25-2.00 g/kg is shown in [Table 2]. A significant improvement in glucose tolerance with extracts of G. arborea, S. pinnata, K. zeylanica, S. caryophyllatum, S. dulcis and S. alnifolia at doses of 1.00, 1.25 and 2.00 g/kg was found in diabetic rats. The improvement on glucose tolerance at doses of 0.25, 0. 50, 0.75 g/kg was statistically non-significant for the above six plant extracts (P > 0.05). The root extract of L. galanga and the leaf extract of C. grandis showed optimum effectiveness at the dose of 1.25 g/kg and 0.75 g/kg respectively (P < 0.05). In addition, when compared to untreated diabetic rats the area under the curve during 4 h period was significantly decreased in both plant extract treated (at and above the therapeutic dose) and glibenclamide treated diabetic rats. 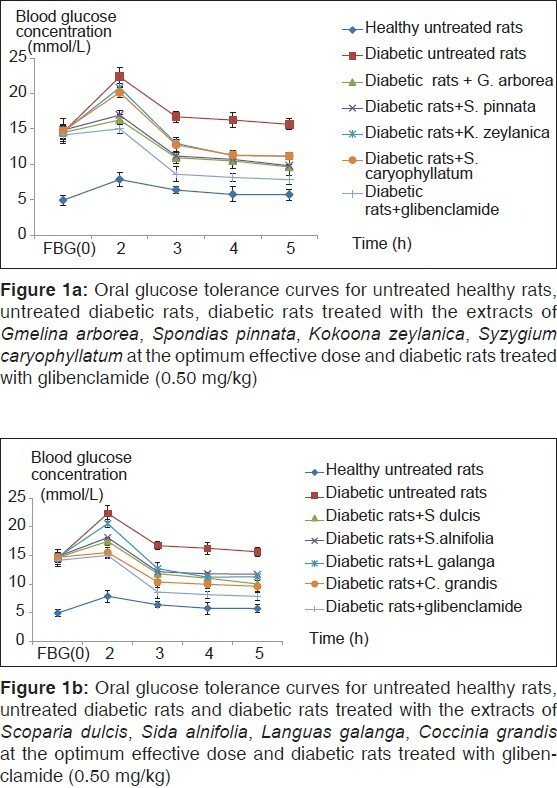 The oral glucose tolerance curves for normal untreated and diabetic treated rats at the optimum effective dose are shown in [Figure 1]a and b. 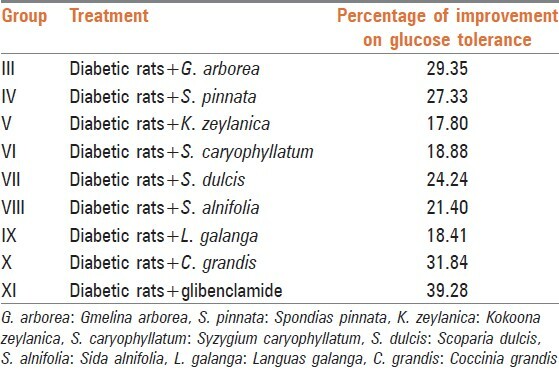 The improvement on glucose tolerance at the optimum effective dose was in the decreasing order of G. arborea, S. pinnata, S. dulcis, alnifolia, S. caryophyllatum, L. galanga and C. grandis in alloxan induced diabetic rats [Table 3]. Experimental diabetes in animals has provided considerable insight into the physiological and biochemical derangements of the diabetic state. Alloxan is widely used as a diabetogenic agent in experimental animals. In addition alloxan induced rat model has been used to study the antidiabetic effects of several plant products. Alloxan induces diabetes mellitus by destroying the insulin producing beta cells of the islets of Langerhans in the pancreas. Moreover, diabetogenic effect of alloxan is due to the excess production of reactive oxygen species leading to cytotoxicity in pancreatic beta cells, which reduces the synthesis and release of insulin. This effect was seen in the current study through the elevation of blood glucose concentration in alloxan induced diabetic rats compared with healthy rats. The optimum effective dose for aqueous extracts of G. arborea, S. pinnata, K. zeylanica, S. caryophyllatum, S. dulcis and S. alnifolia was found to be 1.00 g/kg and was approximately equivalent to the therapeutic dose of relevant extract. The root extract of L. galanga and leaf extract of C. grandis showed optimum effectiveness at the dose of 1.25 g/kg and 0.75 g/kg respectively. The leaf extract of C. grandis appeared to be a potent antihyperglycaemic agent in diabetic rats. The optimum effective dose was subsequently used to determine the long-term efficacy and the mechanism of action of these plant extracts. The glucose lowering effect produced by plant extracts increases significantly with time. This is well manipulated through the total area under the curve over a period of time. Low total area under the curve reflects high efficacy or improvement on glucose tolerance of the extract. The leaf extract of C. grandis showed an improvement of 31.84% at the dose of 0.75 g/kg over a glucose load, which is comparable with the improvement produced by glibenclamide. In response to a glucose load, the excessive amount of glucose in the blood induces insulin secretion. This secreted insulin stimulates the peripheral glucose utilization. In all diabetic treated groups the blood glucose concentration was always lower than the blood glucose concentration of diabetic untreated rats at each time interval. This may be due to the supportive action of glucose utilization by these plant extracts. Further studies are in progress to elucidate mechanisms of antihyperglycaemic activity of the plant extracts. This study revealed that the optimum effective dose to produce the antihyperglycaemic effect shown by the improvement of glucose tolerance in alloxan induced diabetic rats to be 1.00 g/kg for stem bark extract of G. arborea, S. pinnata, K. zeylanica, S. caryophyllatum, arial part extract of S. dulcis, S. alnifolia, 0.75 g/kg for the leaf extract of C. grandis and 1.25 g/kg for the root extract of L. galanga. The results of the acute toxicity study suggest that the eight plant extracts are safe in rats up to a dose of 2.00 g/kg. The improvement on glucose tolerance of the leaf extract of C. grandis at the dose of 0.75 g/kg was comparable with the effect of glibenclamide (0.5 mg/kg). The authors wish to thank Dr. D.A.B.N. Gunarathne, Department of Crop Science, Faculty of Agriculture, University of Ruhuna, Sri Lanka for his guidance in statistical data analysis, Mrs. B.M.S. Malkanthie and Mr. G.H.J.M. Priyashantha, Faculty of Medicine, University of Ruhuna, Sri Lanka for technical assistance. 1. Dheer R, Bhatnagar P. A study of the antidiabetic activity of Barleria prionitis Linn. Indian J Pharmacol 2010;42:70-3. 2. Mohommadi J, Saadipour K, Delaviz H, Mohommadi B. Antidiabetic effects of an alcoholic extract of Juglans regia in an animal model. Turk J Med Sci 2011;41:685-91. 3. Kala MJ, Tresina PS, Mohan VR. Antioxidant, antihyperlipidaemic and antidiabetic activity of Eugenia floccosa bedd leaves in alloxan induced diabetic rats. J Basic Clin Pharm 2012;3:235-40. 4. Hsu YJ, Lee TH, Chang CL, Huang YT, Yang WC. Anti-hyperglycemic effects and mechanism of Bidens pilosa water extract. J Ethnopharmacol 2009;122:379-83. 5. Chauhan PK, Pandey IP, Dhatwalia VK. Evaluation of the anti-diabetic effect of ethanolic and methanolic extracts of Centella asiatica leaves extract on alloxan induced diabetic rats. Adv Biol Res 2010;4:27-30. 6. Eze ED, Mohommed A, Musa KY, Tanko Y. Evaluation of effect of ethanolic extract of Mucuna pruriens on blood glucose levels in alloxan induced diabetic Wistar rats. Asian J Med Sci 2012;4:23-8. 7. Ediriweera ER, Rathnasooriya WD. A review of herbs used in diabetes mellitus by Sri Lankan ayurvedic and traditional physicians. Ayu 2009;30:373-91. 8. Ecobichon DJ. The basis of toxicology testing. New York: CRC press; 1997. p. 43-86. 9. Trinder P. Determination of blood glucose using an oxidase-peroxidase system with a non-carcinogenic chromogen. J Clin Pathol 1969;22:158-61. 10. Purves RD. Optimum numerical integration methods for estimation of area-under-the-curve (AUC) and area-under-the-moment-curve (AUMC). J Pharmacokinet Biopharm 1992;20:211-26. 11. Dhawan BN, Srimal RC. Acute toxicity and gross effects. In: Laboratory Manual for Pharmacological Evaluation of Natural Products. India, United Nations Industrial Development Organization and International Center for Science and High Technology; 1980. p. 17-20. 12. Tchamadeu MC, Dzeufiet PD, Nouga CC, Azebaze AG, Allard J, Girolami JP, et al. Hypoglycaemic effects of Mammea africana (Guttiferae) in diabetic rats. J Ethnopharmacol 2010;127:368-72. 13. Oguanobi NI, Chijioke CP, Ghasi SI. Effects of aqueous leaf extract of Ocimum gratissimum on oral glucose tolerance test in type-2 model diabetic rats. Afr J Pharm Pharmacol 2012;6:630-5. 14. Etuk EU. Animal models for studying diabetes mellitus. Agric Biol J N Am 2010;1:130-4. 15. Fröde TS, Medeiros YS. Animal models to test drugs with potential antidiabetic activity. J Ethnopharmacol 2008;115:173-83. 16. Attele AS, Zhou YP, Xie JT, Wu JA, Zhang L, Dey L, et al. Antidiabetic effects of Panax ginseng berry extract and the identification of an effective component. Diabetes 2002;51:1851-8. 17. Kasabri V, Afifi FU, Hamdan I. In vitro and in vivo acute antihyperglycemic effects of five selected indigenous plants from Jordan used in traditional medicine. J Ethnopharmacol 2011;133:888-96. 18. Ragini V, Prasad KV, Bharathi K. Antidiabetic activity of Shorea tumbuggaia rox. Int J Innov Pharm Res 2011;2:113-21. 19. Eseyln O, Ebong P, Eyong E, Awofisayo O, Agboke A. Effect of Telfairia occidentalis on oral glucose in rats. Afr J Pharm Pharmacol 2010;4:368-72. 20. Sayed MR, Mourad IM, Sayed DA. Biochemical changes in experimental diabetes before and after treatment with Mangifera indica and Psidum guava extracts. Int J Pharm Sci 2011;2:29-41. 21. Jarald EE, Joshi SB, Jain DC. Biochemical study on the hypoglycaemic effects of extract and fraction of Acasia catechu wild in alloxan induced diabetic rats. Int J Diabetes Metab 2009;17:63-9.